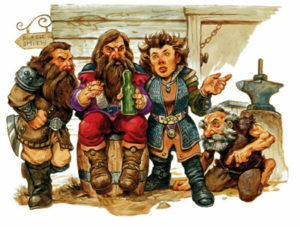 Since orcs do not exist in the Dragonlance campaign setting Krynnish dwarves lack the Hatred racial trait typical of the standard Pathfinder dwarf. This also negates the +1 bonus on attack rolls against humanoid creatures of the goblinoid subtype associated with this ability. Languages: Hill dwarves begin play speaking Common and Dwarven. Hill dwarves with high Intelligence scores can choose from the following: Elven, Goblin, and Ogre. +2 Constitution, +2 Wisdom, -2 Dexterity: Mountain dwarves are as tough and wise as their hill dwarven cousins, but less agile. +2 Con, +2 Wis, -4 Cha: Dark dwarves share their cousins’ stamina and common sense, but are far more sullen and reserved. Darkvision: Dark dwarves can see in the dark up to 120 feet. Deep Stalker: Perception and Stealth are always class skills for dark dwarves. Light Sensitivity: Dark dwarves are dazzled in areas of bright sunlight or within the radius of a daylight spell. Languages: Dark dwarves begin play speaking Common and Dwarven. Dark dwarves with high Intelligence scores can choose from the following: Gnome, Hammertalk, and Ogre. +2 Dexterity, +2 Constitution, -4 Intelligence: Gully dwarves are nimble and resilient. However, their intellectual facilities are severely lacking. Small: Gully dwarves are Small creatures and gain a +1 size bonus to their AC, a +1 size bonus on attack rolls, a -1 penalty to their Combat Maneuver Bonus and Combat Maneuver Defense, and a +4 size bonus on Stealth checks. Cowardly: Gully dwarves suffer a -4 penalty against all Intimidate checks and saving throws versus fear effects. Pitiable: Gully dwarves receive a +4 racial bonus on Diplomacy checks to change the initial attitudes of nonplayer characters in order to prevent themselves from being harmed. Plagueborne: Gully dwarves gain a +2 racial bonus on saving throws against disease, ingested poisons, and becoming nauseated or sickened. Survival Instincts: Gully dwarves receive a +2 racial bonus to Stealth and Survival skill checks. +2 to One Ability Score: Half-dwarf characters get a +2 bonus to one ability score of their choice at creation to represent their varied nature. Medium: Half-dwarves are Medium creatures and have no bonuses or penalties due to their size. Normal Speed: Half-dwarves have a base speed of 30 ft.
Darkvision: Half-dwarves can see in the dark up to 60 ft. Dwarf Blood: Half-dwarves count as both dwarves and humans for any effect related to race. Resistant: Half-dwarves gain a +2 racial bonus on saving throws against mind-affecting effects and poison. Skilled: Half-dwarves receive a +2 racial bonus on all Craft or Profession checks. Stability: Half-dwarves gain a +4 racial bonus to their Combat Maneuver Defense when resisting a bull rush or trip attempt while standing on the ground. Weapon Familiarity: Half-dwarves are proficient with battleaxes, heavy picks, and warhammers, and treat any weapon with the word “dwarven” in its name as a martial weapon. Languages: Half-dwarves begin play speaking Common and Dwarven. Half-dwarves with high Intelligence scores can choose any languages they want (except secret languages, such as Druidic).